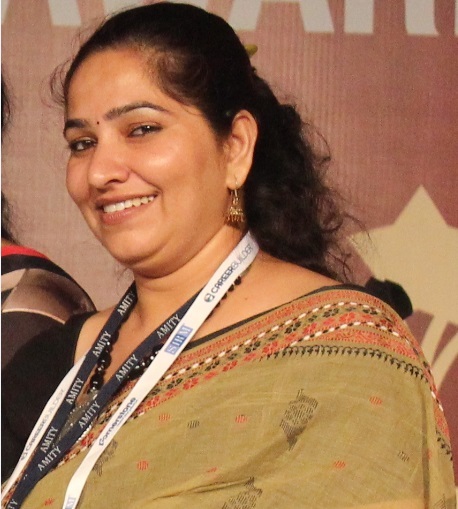 Welcome A. Prof. Seema Rawat from Amity University Uttar Pradesh(India) to be committee member! More Than 90 research papers published in international conference and journals out of 30 in Scopus Indexed. • Supervised 30 awarded M.Tech (24 M.Tech fulltime. 06 M.Tech. Part time) Dissertation. • Supervised 01 Awarded M.Phil. Dissertation. • Supervised 100+ B.Tech projects. 1. First women to be part of IP colloquium program of WIPO Switzerland Geneva. 2. Active Member WEC (women Entrepreneurial Cell). a. Jury member & Panel member at MSME Technology Incubators. b. Part of Jury Member as Angel Investor for Tech Fest -IIT Mumbai, Rajasthan Startup Fest, IIT Delhi Startups, VC Circle, NASSCOM and many more. Panelist at Samadhan Divas organized by I M SME of India for SMEs and Women Entrepreneur. Spoke on 3Ms: Market, Money and mentor. Data Mining & Data Warehousing, Design and Analysis of Algorithms, Computer Architecture, Data Structures & File Structures, Operating System, Software Engineering, Data Base Management System, Computer Network Security, Fundamentals of Information Technology, Programming Using C++, Programming Concepts & C Language.